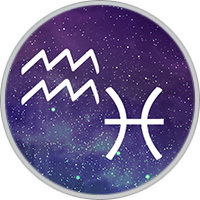 Spiritual, compassionate, imaginitive, peace-loving, artistic and very friendly, this Cusp sign combines the quirky energy of the air sign Aquarius, with the dreamy Pisces to produce individuals who are very intuitive and receptive to the needs of others. They are very intellectual at a high level, but fail miserably when it comes to practical details and following through. They can be so taken up with their thoughts and ideas that they will become forgetful, turn up late for appointments and lose things. Although strongly spiritual, this Zodiac combination may not be religious. They are artistic and have ideals, but sometimes these are undefined and vague and not at all practical. They see reality as an intrusion, which can then make them pessimistic and lacking in mental energy, but they are willing to adapt and are broad-minded, so their ideals can change if necessary. Aquarius/Pisces are logical and self-confident, but they can become aloof from people around them and may seem cold toward people who don’t share their attitude to life. They can also become frightened or withdrawn if their emotions are abused too many times and will hide their real selves. Very sociable, they find that contact with others and excercise will relieve stress – team sports are best for them. In love Aquarius and Pisces can be flirty, caring and romantic. Those born on the Aquarius-Pisces cusp are sensitive. They are more open to their personal space and universal space than they are to worldly concerns. They spend time digging within themselves for better understanding. Managing day to day life may be more challenging for them because it is hard for them to focus on these mundane things. Aquarius-Pisces wants experiences, but it is difficult for them to remain objective. Because of their ultra-sensitivity, this can be a difficult balance for them to achieve. For the best results, they need to put themselves out there and not hide away. They need to learn to feel more comfortable in this world. Aquarius-Pisces is compassionate, imaginative and sympathetic to others. They set goals, but they may procrastinate or be so disorganized that they create their own obstacles. They may be eccentric and offbeat, but they are definitely original. They are often multi-talented and feel the need to change the world. This may be difficult since they can be painfully shy. They are sometimes blessed with incredible musical abilities. Aquarius-Pisces likes to socialize. Being with others helps them relieve stress and anxiety. They love water activities. They are flirtatious and romantic, and they genuinely care for others. Their compassion is all-encompassing. They have a unique angle on the world that others just don’t see. Aquarius-Pisces is a natural psychic. If they don’t get support for this at an early age, they will shut it down and pretend it doesn’t exist. It may be difficult for them to open up to others once they realize they see things differently because they don’t want to be ridiculed. The Cusp of Sensitivity is known for tolerance, sensitivity, uniqueness, talent, artistic merit, emotions, practicality, dreaming, sensuality, idealism, flirtatiousness, pride, loyalty, romance, compassion, sympathy and imagination. They may also be pessimistic, hyper-sensitive, moody, secretive, impatient, stubborn, aloof, cold and quarrelsome. Some would call Aquarius-Pisces cusp a bit peculiar. They like luxury, and this desire may keep them in the day to day world enough to keep their business obligations. Their kind nature can make them overbook their time, trying to oblige everyone; then when they forget an engagement, they let people down. While they can exaggerate their accomplishments, they often decline telling about their failures or troubles. They love their freedom, and their dreaminess can lead to spiritual depth and insight. They may be responsible for amazing creative works. People are attracted to them, and in well balanced circumstances, they enjoy travel as well as delving into science or religion. The great strength of the Aquarius and Pisces combination is in their visionary nature and their compassion. They are adept in persuading others see things in a new light. Their ability to work around and even break the rules to help others reach their fullest potential makes them one of the most understanding Cusp signs of the zodiac. Delving into spiritual matters and philosophical ideals is much more important to these folks than simply managing the details of day-to-day life. For this reason they may lose things, forget appointments, show up late or stand you up. So, more attention to real world, sometimes.